A man plants a dozen fruit trees in his yard. After a few years most of the trees are producing fruit – apples, pears, cherries and peaches. After a few more years this owner is very happy with most of his trees which produce enough good fruit for his family and friends. However, there are two trees that have caused him great distress. One tree had never produced anything except leaves. The other produces loads of pears, but they taste so bad no one has been found that could eat more than one bite. He has done every thing possible to help the trees get better. He has pruned them, fertilized them, watered them, kept the pests off them, and has even tried products like fruit set and foliar fertilizers, but all to no avail. The one tree produces nothing, and the other only inedible fruit. What should he do with them? Now a man who remembers the reason he planted those trees would simply recognize they were bad trees and tear them out and plant new ones. However, if the man acted like much of our society does in its treatment of its bad fruit, he would continue efforts to rehabilitate them. He would feel sorry for them and excuse their lack of productivity reasoning they had rough time as a seedling or were traumatized by a deer. He might even give them a different name in an attempt to give them value. The apple is now a “flowering apple” and valued for its brief beauty for a couple of weeks in Spring even if is in the back of the orchard where no one sees it. The bad pears he now donates to a charity and gets a tax write off. All silliness aside, I am amazed at how criminals are treated by our society. Throughout the U.S. jails and penitentiaries are now often “detention centers” and “correctional facilities.” In addition, every excuse imaginable, and some unimaginable, are used to justify the evil deeds of criminals. Large portions of the church also now refrain from calling sin what it is. Even within the evangelical church the ideas and philosophy of modern secular psychology has replaced the precepts of the Scriptures resulting in sins such as abuse of alcohol or drugs, sexual immorality, habitual lying, stealing, and such being labeled as various diseases. No, those things are not diseases, but they are the manifestation of a disease, and that disease is sin. The disease of sin is always fatal, but it does have one cure – redemption and regeneration by the Lord Jesus Christ! Though many claim that Jesus is always “loving” in the modern sense of never saying anything that would hurt a person’s self-esteem (pride), that is not the Jesus of the Scriptures. Jesus is not someone who is insecure trying to do anything for you so that you will like Him, and God the Father is not some doting grandfather type who will excuse all the errors of His grandchildren. Jesus is the creator of all things (Colossians 1). He is the judge of the universe (Revelation 20), and He is deserving of your praise and worship regardless of how you emotionally feel about Him (Philippians 2). The Jesus of the Bible is of strong character and not afraid of facing His enemies and rebuking them and even condemning them when necessary. We will see that again in our study of Matthew 12:33-37 this morning as Jesus exposes the hearts of the Pharisees. Recall that tension has been building between Jesus and the hypocritical religious leaders ever since His public ministry began. Jesus refused to follow the legalistic traditions of the Pharisees or to teach the Scriptures according to the theology of the Scribes and has exposed the error of both groups. They have in turn come to hate Him. After Jesus healed the man with the withered hand on a Sabbath Day (Matthew 12:9-15), the Pharisees and other groups began to plot how they might murder Him. The particular occasion for Jesus’ words in Matthew 12:33-37 was the healing of a man who was both blind and dumb due to a demon (Matthew 12:22-24). Jesus cast out the demon and the man regained his sight and ability to speak. The crowds began to wonder if Jesus was indeed the Son of David – the long awaited Messiah. The Pharisees and the Scribes began to say to the people, “This man casts out demons only by Beelzebub the ruler of demons.” Jesus knew their thoughts and confronted them. Their accusation was illogical, inconsistent with their own practice, insurrectionary against God Himself, and inane – it was a stupid thing to say. The religious leaders were so blinded by their hatred for Jesus that they overlooked every sign and ignored every effort of the Holy Spirit that demonstrated that Jesus was the Messiah. Instead, they now attributed the work of the Holy Spirit to Satan. They committed the one and only sin that cannot be forgiven. They spoke against the Holy Spirit and blasphemed Him. Why can’t that sin be forgiven? Simply because nothing else can be done to bring a person to the repentance necessary in order to ask for and receive forgiveness. And while this particular sin cannot be repeated in the same manner today as then, there is still a grave danger for anyone that continues to ignore the prodding of the Holy Spirit. Continued grieving the Spirit leads to resisting the Spirit which leads to quenching the Spirit, and that in turn results in a seared conscience – a heart hardened in sin and left alone by the Holy Spirit. In Matthew 12:33 Jesus continues His condemnation of the Pharisees for their unfounded accusation against Him. “Either make the tree good, and its fruit good; or make the tree bad, and its fruit bad; for the tree is known by its fruit.” This is an axiomatic truth that Jesus uses to call attention again to the illogic of the Pharisees accusation against Him. The statement is in reference to who Jesus is. The verb “make” here (poievw / poie ) is in the sense of “consider to be” in the same way we might say that “he is not the genius some people make him to be.” The tree and its fruit must be considered either good or bad together. In effect, Jesus is saying, “Either consider me and what I do as good, or consider me and what I do as bad. What I am will be known by what I do.” Who Jesus is must be determined by what He says and does regardless of personal feelings. Jesus’s words and works point undeniably to His goodness and Divine power. Jesus is backing up His condemnation of them for blaspheming the Holy Spirit. They have seen Jesus do many good things which were obviously the work of God in opposition to evil and sin. Disease, sickness and death are all the results of sin, and Jesus healed the sick and raised the dead. Jesus also intruded into Satan’s territory, overpowered him and cast out the demons that were plaguing men. These are all evidences of good fruit, yet they accused Him of being a bad tree, but a tree is known by its fruit, not the other way around. In verse 34-35 Jesus becomes even more personal with the Pharisees and exposes their evil hearts. Some people may be shocked that the Lord Jesus Christ would call someone names, but Jesus is doing so to describe their character. John the Baptist called these false religious leaders this same name in Matthew 3:7 and we will find that Jesus uses it again of them in Matthew 23:33. Viper (e]chdna / echidna) is the name used for very dangerous poisonous snakes that live in the Mediterranean region. They were both deadly and deceptive. Their small size and coloration would allow them to blend into the area they were lying so that you would not see them until it was too late. Acts 28:3,6 records the Apostle Paul being bitten by one of these snakes as he was gathering wood. The natives expected him to immediately “swell up or suddenly fall down dead.” When Paul did not, they immediately and properly attributed this miracle to the God Paul worshiped. Where did their hypocritical self-righteousness and soul damning teaching come from? Out of the treasure of their hearts. Jesus attributes what they said with their mouths as arising from the treasury (qhsaurovV / th sauros) of their hearts. We get our word “Thesaurus” which is “a treasury of words” from it. The word “heart” (kardiva / kardia) is used here metaphorically to refer to the immaterial inner man in which the treasure of all thoughts and will are stored. Attitudes, desires, ambitions, loyalties, beliefs and opinions all reside there and from it the mouth draws its words and expressions. Don’t be confused by this. In American English we often use “heart” as a figure of speech to refer to the seat of emotions, of how we feel. But in the Bible, the stomach was used to refer to feelings while the heart was used to talk about the seat of the mind and will. In the Scriptures, a person with an evil heart it is not someone with negative emotions, but someone who has evil thoughts – which in turn will produce evil attitudes and negative emotions. It is self evident then that a heart full of good treasure brings forth good things in what a person says and does. Likewise, a heart full of evil treasure will bring forth evil actions and words. It is the same as in James 3:11, “Does a fountain send forth at the same place sweet [water] and bitter?” In computer talk – GIGO – Garbage in, Garbage Out. The quality of what is in a person’s heart determines what comes out of the mouth. Jesus is very pointed in telling the Pharisees that their evil accusation against Him came from their evil hearts. Their thoughts were controlled by their pride and not by God. They thought in terms of themselves and what they might gain rather than in terms of what is good for the Kingdom of God. An evil mind produces an evil tongue. The same is true today. What a person says is a reflection of what is in their minds – what they think and believe. Jesus gave both the Pharisees and all men a warning in the principle He sets out in verse 36 & 37. “But I say to you, that every careless word that men shall speak, they shall render account for it in the day of judgment. For by your words you shall be justified, and by your words you shall be condemned.” Now is Jesus in anyway saying that you are saved by what you say and do? No. Salvation – justification – is not produced by either words or deeds, but the words and deeds are clear manifestations of what is in the heart. They are the objective, observable evidence of a person’s spiritual condition – whether good or bad, saved or unregenerate, not the cause of it. Salvation includes regeneration of the heart. What was once dead in trespasses and sin is made alive unto God and the individual is transferred from the kingdom of darkness into the kingdom of light. Since the treasury of the heart is changed, salvation will result in good words that confirm the reality of what has taken place in the heart. For the true Christian there will be an accounting as well. Paul writes in 2 Corinthians 5:10, “For we must all appear before the judgment seat of Christ; that every one may be recompensed for his deeds in the body, according to what he has done, whether good or bad.” Of course this judgment will not be in condemnation for Paul had already written in Romans 8:1, “There is therefore now no condemnation to them which are in Christ Jesus, who walk not after the flesh, but after the Spirit.” The condemnation is gone, but there is still accounting for what we have said and done whether it be “wood, hay and stubble” which will be burned up, or “gold, jewels and precious stones” which will reap rewards in heaven (1 Cor 3:12-15). How careful are you about what you say? This should be a sobering passage for all of us and especially for non-believers who will face a judgment of condemnation in which their very words, both those evil by deliberate design and those evil just by carelessness, will testify against them. But believers should also be serious about this as well. Are you careful about what you say? And are you careful for the right reason? You see, some of you may be bothered by Jesus’ words here, but it is for the wrong reason. But on the other hand, some of you may not think this applies to you at all. The problem is one of Legalism and License. Legalism has been a reoccurring theme in our study of the actions and teaching of the Pharisees, but its opposite, license, has rarely been mentioned. Today I want to use this passage to show you the nature of the way the Lord wants you to live and why both legalism and license are wrong. Legalism is what entrapped the Pharisees into a system of false religion. Legalism is founded on the idea that God’s approval is based on doing certain things and not doing certain other things. The particular list an individual develops of things that are either done or not done often starts with a basis in Scripture, but since Scripture – especially the New Testament – is more a compilation of principles and precepts rather than a series of specific rules and regulations, man quickly fills in the specifics and comes up with his own list of what is and is not acceptable before God. Man’s law replaces God’s precepts. Legalism says, “I am good and have gained God’s approval because I have done thus and so and not done thus and so. It views spirituality from the outside and judges itself and others based on what it thinks is or is not godly. Legalism results in attitudes of self-righteousness and condemnation. Beware that this is an extremely simple error to slip into and which most if not all people fall into at some point and may be unaware of legalistic views they still harbor. Now the opposite of legalism is license. License results from an over emphasis on the grace of God to the exclusion or near exclusion of His holiness. The basis of thinking is, “I am good and have gained God’s approval because Jesus has forgiven me and so it no longer really matters that much what I do.” It views spirituality as being inside and therefore indiscernible to anyone else. Generally those who have this view pride themselves on their ability to tolerate sinful behavior in others. They are usually quick to partially quote Matthew 7:1-2 with “judge not lest you be judged.” Such a person will stress their liberty in Christ to the point that they needlessly offend their Christian brothers (see Romans 14 or 1 Corinthians 8) and open themselves up to practicing clearly sinful behavior which brings open shame to the name of Jesus Christ. What is the truth? Is spirituality outside or inside? Look again at what Jesus says here in Matthew 12:33 & 35, “. . . for the tree will be known by its fruit . . . The good man out of his good treasure brings forth what is good; and the evil man out of his evil treasure brings forth what is evil.” True spirituality is both inside and outside! The libertine needs to understand that a person’s behavior and words do reveal what is on the inside and that toleration of sin is an affront to God’s holiness. In addition, though Christians are not under the Law of Moses, we are under the Law of Christ (1 Corinthians 9:21). The Great Commission includes, “teaching them to observe all that I commanded you” (Matthew 28:20). The legalist needs to remember that “all our righteous deeds are like a filthy garment” before Him. We are not good because of what we do or do not do. We are good because of what Jesus Christ has done for us and in us. We are good because the Holy Spirit has regenerated us and given us new hearts. Out of an evil heart come evil deeds. A person may be able to fake it for awhile and play Christianity by talking the talk and walking the walk outwardly, but eventually the truth will come out. The righteous do good out of love for God and desire to please Him, not in an effort to gain His approval. Let me quickly illustrate true spirituality verses legalism and licentiousness this with a specific issue. It is an issue that can be somewhat emotional, so I want you to listen carefully. I do not want anyone saying that I said something that I did not. The issue is drinking alcoholic beverages. The libertine thinks only of himself and what he wants. The legalist is pretty much controlled by what other people might think. 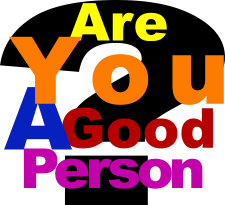 How should a person who truly spiritual approach this question or any other for that matter? Very simply, “What does Jesus want?” The concern is not for enjoying freedom nor is it what others may or may not think. The concern is what would be pleasing to God in the here and now and then doing that. This is not to earn His approval, but to demonstrate you love for Him. From a heart full of good treasure will come a wealth of Scriptural precepts and principles that will be weighed against each other. The Biblical warnings will be weighed against the examples of wine being drunk by Jesus, the apostles and most of the prophets. Thought will be given to what Scripture means by “wine” – (and in brief I will say that no Biblical case can be made for the use of “hard liquors”). Consideration of the practice of freedom in Christ will be weighed against offending a brother in a way that will cause him to stumble (Romans 14; 1 Corinthians 13). The issue of being spiritual then is not a matter of drinking or not drinking – it is a matter of understanding God’s revealed word and then doing what would be best for His kingdom. Now I don’t want anyone to go saying that Pastor approves of drinking because I did not say that. To be frank, whether you drink or not is not nearly the concern to me as your reasons for partaking or abstaining. As we have been going through our study of the life of Jesus Christ we have seeing the many warnings against Pharisaical legalism and this morning are warnings to those who think they have license to do what ever they want. It is my prayer that the Holy Spirit will remove every vestige of both legalism and license from each of us, and that each one would follow the scriptural commands of 2 Corinthians 10:5 and Matthew 22:37 to have every thought taken captive by Christ and to love the Lord God with all your heart, soul, mind and strength. If that were true, then all the peripherals would take care of themselves because a good tree bears good fruit. That is true spirituality. What kind of tree are you? Your words and deeds will broadcast that to the world and God will hold you accountable for all of them. Parents, you are responsible to apply God’s Word to your children’s lives. Here is some help. Young Children – draw a picture about something you hear during the sermon. Explain your picture(s) to your parents at lunch. Older Children – Do one or more of the following: 1) Write down all the verses mentioned in the sermon and look them up later. 2) Count how many times a reference is made to speaking. Talk with your parents about how your speech reveals what is in your heart. Questions to consider in discussing the sermon with others. Why is are the scribes and Pharisees antagonistic toward Jesus? What is blasphemy of the Holy Spirit and how did the scribes and Pharisees commit it? Why can’t it be forgiven? What is the danger of grieving, resisting and quenching the Spirit? What is Jesus’ point in Matthew 12:33? What was the fruit of His ministry and teaching? Why did Jesus call them vipers? What does the “heart” refer to in Matthew 12:34? What reveals the nature of the treasure stored in the heart? How does God use the words of the unregenerate to judge them? What accounting will believers give God for their words? Explain “careless words” and give examples of speech that fit that description. Give scripture references if possible. What is legalism? Why is it contrary to righteousness? What is licentiousness? Why is it contrary to righteousness? How does true righteousness differ from both? What are the marks of true righteousness? How does a libertine view drinking? A legalist? What is your view? What are the righteous reasons for either partaking or abstaining from drink? Are you letting all your thoughts be taken captive to Christ?